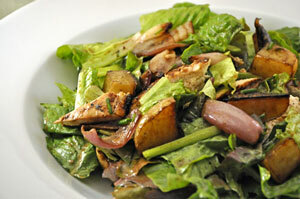 Salad with grilled Chicken, Potatoes, Shallots and Onions, Thyme for Cooking. Grilling the chicken breast and vegetables adds the perfect summer flavors to make this salad an easy hit. Grilling the shallots and onions brings out and caramelizes their natural sugars. The entire dish is made outside on the barbecue (hopefully). In small bowl whisk together 2 tbs vinegar, 2 tbs oil and garlic powder. Pour over chicken and set aside to marinate. Clean onion and cut into quarters vertically. Cut potatoes into large bite-size pieces. Mix 1 tbs vinegar and 1 tbs olive oil, add potatoes, onions, shallots and toss to coat. Cook on barbecue grill in any old metal pan that has been designated for barbecue use - stirring frequently, for about 25 minutes or until brown and done. OR put in 400F (200C) oven for 30 minutes or until done- stirring half way through cooking time. Remove chicken from marinade and cook on barbecue for 14 - 18 minutes, turning once. OR sauté for about the same amount of time - or until done. In small bowl whisk mustard and vinegar. Slowly add oil whisking constantly. You may have to stop adding oil and just whisk periodically - you don't want to see the oil separately - it should be incorporated as it goes into the mixture. Add oil and whisk until it emulsifies (thickens and combines). Finely mince garlic and snip herbs. Add to vinaigrette and whisk. Prepare lettuce, tear if needed and put in a large salad bowl. Add 2 - 3 tbs vinaigrette and mix well. Taste and add more as needed. Remove vegetables and chicken from wherever. Add chicken and vegetables to salad, toss once or twice and serve.